This meteorite was discovered a few kilometers northeast of Haima. Access to the area is easy ; you just take Road 37 then after 6 km you drive due north for a few kilometers. Unfortunately, the search area is near a huge training center of the Omani police. We were fortunate to find two specimens during two different expeditions in Oman. JAH 955 is a pairing to RAS 201 meteorite but the strewnfield is on Jiddat Al Harasis and Ramlat As Sahmah regions. That’s why those two meteorites have those different names. 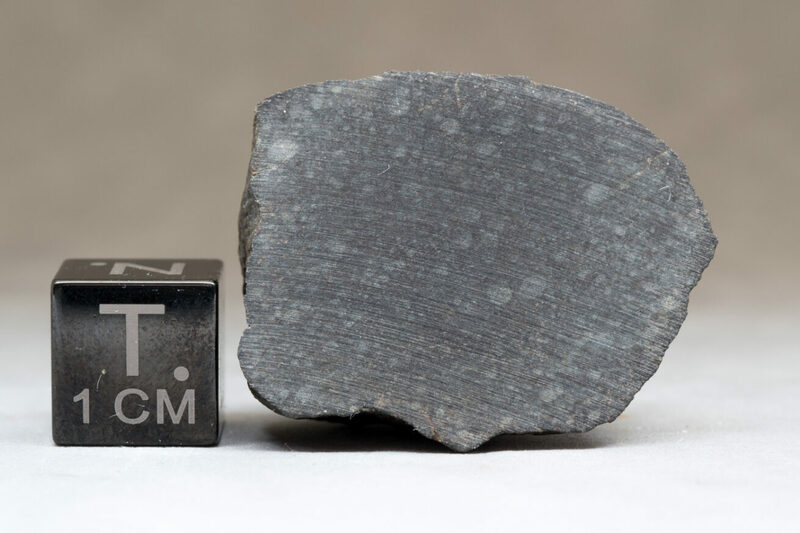 The concentrations and isotopic compositions of helium, neon and argon were analyzed in fragments of this meteorite, which allowed scientists to determine that the age of exposure to cosmic rays of RAS 201 was 5.8 million years. The rumurutites (or R chondrites) are chemically opposite enstatite chondrites. Rumurutites are highly oxidized and contain high levels of iron-rich olivine. 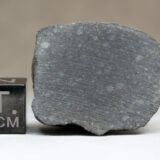 This type of meteorites often contain xenolithic inclusions, indicating that they have a regolithic origin (they come from the surface of a parent body impacted by many different types of asteroids).